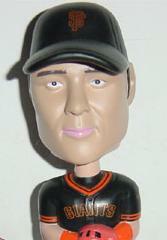 Today's honorary bay boy is Tsuyoshi Shinjo and he's here because I found a picture of his bobblehead. They can't all be winners, folks. Giants 10, Dodgers 2. San Francisco took a .5 game lead in the West riding a Jonathan Sanchez 7 inning, 1-run 12 strikeout performance to victory. Blog favorite Buster Posey went 2-5 with his 14th home run of the season. He's really good. I thought I should point that out. You're welcome. Some guy named Russell Mitchell hit his first home run of the season for the Dodgers. His batting average (.059) is sad about his OBP (.056). Cardinals 4, Padres 0. Jake Westbrook threw 8 innings of 6-hit shutout ball while walking and striking out 3. That doesn't excite you? How about David Eckstein going 1-3? Work with me people, there were only 6 games yesterday. Mets 6, Pirates 2. Um, let's see. The Mets played someone named Lucas Duda in left field. His middle name is Christopher. Twins 8, White Sox 5. Paul Konerko hit his 37th home run of the season. His .323/.402/.604 line isn't getting much MVP hype which is why I employ Paul Konerko dog. 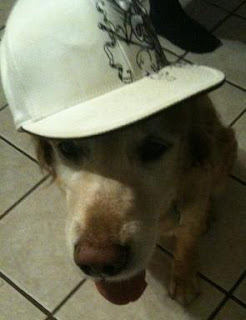 Dogs wearing hats, get on board. Diamondbacks 3, Reds 1. I wish I had more pictures of dogs wearing hats. Logan Ondrusek pitched a scoreless inning for the Reds. Chris Young struck out 3 times for the Backs. Someone bought cotton candy and after two cavities and five sticky fingers, regretted that purchase. Mets 6, Pirates 2. What? We covered this already? I must have been taking a nap.